With our simulation software, you can move production testing from the real shop floor into the virtual reality of your computer. Our new product version Simufact Forming 15 is available now. Watch out for the highlights in Simufact Forming 15. Facing global competition, delivering innovative products at the highest quality, and all for competitive prices – these are the challenges faced by manufacturers today. A targeted analysis, focusing on the single steps involved in the development and manufacturing of products, is helpful to ensure that innovative ideas find their way into production, without the risk of misguided developments. Manufacturing companies all around the world rely on the simulation of single manufacturing steps and often even the entire process chains. Based on CAD data, process simulation moves the design and optimization of manufacturing processes to the virtual world of computers. This ensures the capacity to react to new demands and challenges flexibly, to reliably mastering your manufacturing processes and to minimize the costs for process design and for production. Our products and services have been developed specially for metalworking industries. Simufact simulation products support customers all around the world in the design and optimization of manufacturing processes, relying on Simufact Forming for forming simulations, Simufact Welding for welding simulations, and Simufact Additive for additive manufacturing. … you could give the green light for production even after the very first test of a component? … you could ensure that manufacturing would always employ the most cost-effective process? … you could guarantee that the expert knowledge of experienced staff will remain in your company, even after they’ve left? … you could reduce the development time for the production of a new component from several weeks to only one? With our simulation software, we make it possible for you to move production testing from the shop floor into virtual reality. The more complex the manufacturing process is, the higher the potential for saving costs by virtual testing. The traditional approach involves a mixture of experience and trial and error, with the possibility that various changes to your tools during process designs may be needed, until a satisfactory result is achieved. However, if the design and optimization times of your manufacturing processes can be reduced and production maturity regarding the quality, costs, and efficiency can also be reached faster, you are able to deliver sooner – a clear competitive advantage. Customers from the bulk metal forming industry that rely on process simulation confirm that they were able to reduce the number of physical tests by up to 50 percent immediately after starting to use simulations. Furthermore, they confirm that they could reduce the development time of new components from three weeks down to one week – an enormous potential for saving costs that could be exploited even more with further experience. Without process simulation, questions regarding forging errors, forces on the dies, or die life can only be answered after the first – or second, or third …- physical test. Thanks to virtual testing, manufacturers can identify and avoid critical factors earlier. Our three product lines Simufact Forming, Simufact Welding, and Simufact Additive help you simulate a broad range of forming, joining, and additive manufacturing processes: forging, cold forming, rolling processes including ring-rolling, sheet metal forming, mechanical joining, heat treatment, all common welding processes, and newly powder bed fusion AM processes. As modern simulation tools, our products have been designed for use in design departments, method planning, or process development. In the hands of a production expert or of a development engineer, Simufact software helps you gain a better understanding of the processes. Optimized processes with higher product quality within a very short time are the solution for our customers in a competitive, international market. Our product lines with their modular approach embody our product philosophy: A special manufacturing process needs special functionality – that’s why we provide process-specific modules, in contrast to general-purpose tools that strive to cover all processes. The modular approach of our products allows you to choose the functions relevant to your needs. This approach is cost-effective and can be easily adapt to changing demands. While the application modules contain process-specific functions, the additional modules included in the product lines offer you further functions that are either needed for your daily use of the software, or offer further advantages. Simufact Forming enables the simulation of forming processes. The software covers all essential areas of forming: hot forging, cold forming, sheet metal forming, all rolling processes, open-die forging and mechanical joining. Simufact Forming supports microstructure simulations, the calculation of die stresses and of the material flow as well as the prediction of material properties during heat treatment. 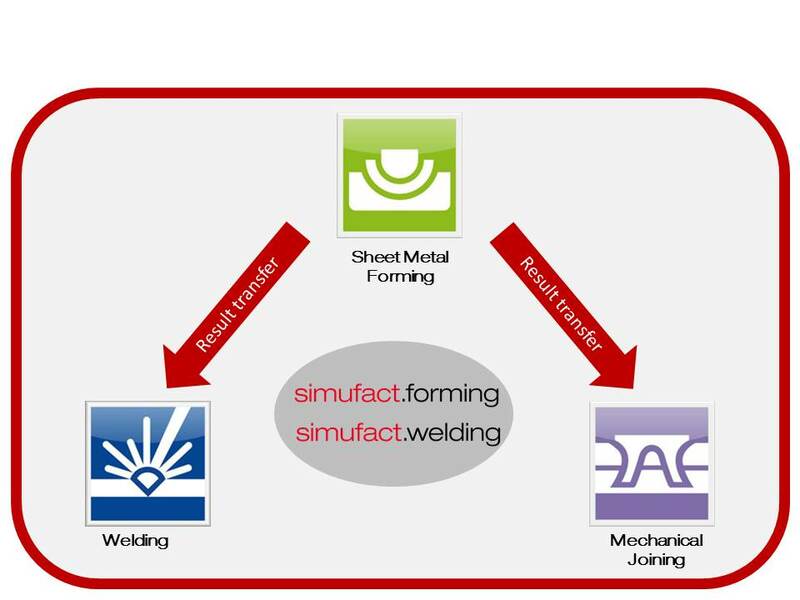 Simufact Welding enables the simulation of welding processes. It is able to model elastic-plastic material behavior and conduct welding structure simulations and welding process simulations. Simufact Welding realistically predicts distortions and residual stresses that occur during welding and helps minimize them in the components while taking into account microstructural changes. Simufact Welding calculates the microstructure properties within the heat affected zone providing conclusions about the weld seam properties, especially relating to its mechanical strength. This allows the user detect welding mistakes, such as hot cracks in the simulation and to avoid them in reality. The software supports the development of the optimal clamping device for the welding process and assists in laying out the best welding sequence. Simufact Welding predicts the final shape of the component and helps to manufacture components within predetermined tolerances in series production. Simufact Additive is a powerful and scalable process simulation environment for ‘right first time’ optimization of laser powder bed fusion processes. The software helps to compensate the distortion, minimize residual stresses and optimize the process parameters. Features include simulation of all the key AM process steps starting with ‘printing’ of the part; followed by heat treatment, cutting the part off the build plate and removal of support structures, plus heat and pressure combined processes (HIP). The modelling is carried out using CAD data in an innovative and newly developed Graphical User Interface (GUI) environment aligned with the real process work flow. Simufact Additive offers an intuitive approach which starts with defining the general process by determining the part and support components through to definition of manufacturing parameters up to the analysis settings and ultimate results. The application modules allow for the simulation of single process steps. However, the modules can also be combined to span applications and products in order to connect the various steps of entire process chains and to simulate these as a whole. A classic example would be multi-step sheet metal forming. When simulating complex sheet structures formed with progressive dies, simulation results are transferred between single forming or rolling processes, and are incorporated into the next process. This way, all kinds of processes can be connected: forming and welding, forming and mechanical joining, or forming and heat treatment processes for example.